We're giving away a Huawei Mate 9 smartphone and a Canon printer! Read on to learn more. Let’s be honest for a moment. Printing from a smartphone hasn’t always been easy. Up until the more recent versions of Android it was, for all practical purposes, nearly impossible. But, things have changed over the years and we’re getting to a place where cloud-based and connected printers make things much simpler. In an increasing number of cases, manufacturers are making it easier to print to their respective products. HP, Canon, Epson, Samsung, and others have all done things in the space to enable mobile printing, and it continues to get better. 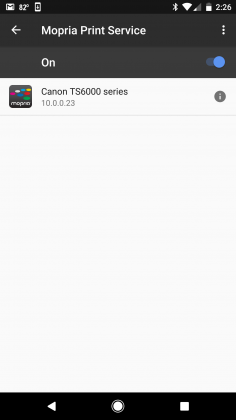 A quick search of the Play Store yields quite a few apps to help you out. In 2014, Mopria released a plug-in for Android that enables printing from devices running Android 4.4+ to Mopria-certified printers and multi-function printers. We’ve recently spent some time playing with the plug-in and have found it to be among the more simple and valuable ways of further extending the capabilities of your smartphone. 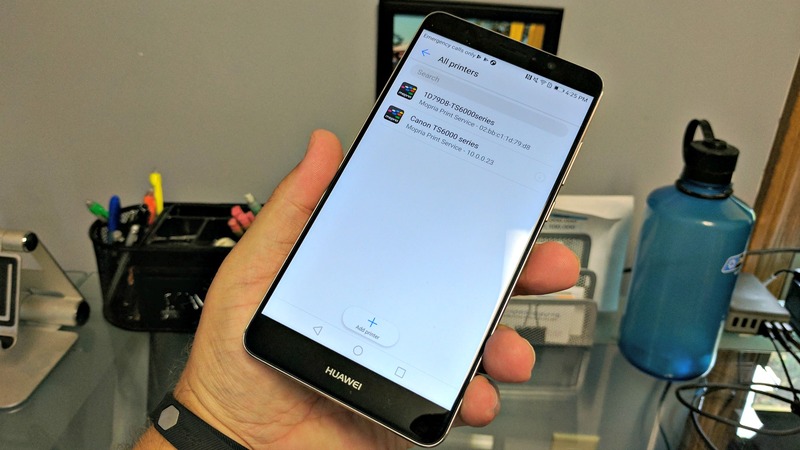 Note: We were sent a Huawei Mate 9 smartphone and a Canon PIXMA TS6020 printer to use in our testing of the Mopria plug-in. Further, we were allowed to keep them after our testing. This did not color our experience one way or the other, but we feel compelled to share this information. 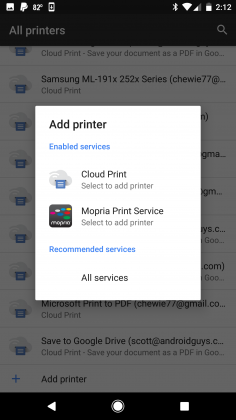 It might sound like a small feature, but one of the things about Huawei’s new phones is that it already comes with support for Mopria-supported printers. Indeed, the handsets are locked and ready to go when it comes to printing to one of the numerous printers and MFPs. 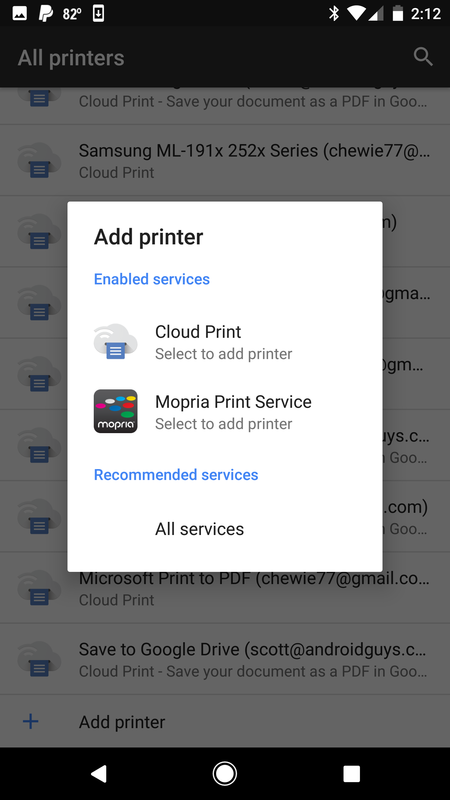 You’ll find there are a wide variety of apps or services in your phone which can print. Chrome, Gmail, Drive, Microsoft Office, and Adobe Acrobat Reader are just some of the more popular clients that you’ll use along the way. Should you want to ready your other phones or tablets for printing, it’s a straightforward process. 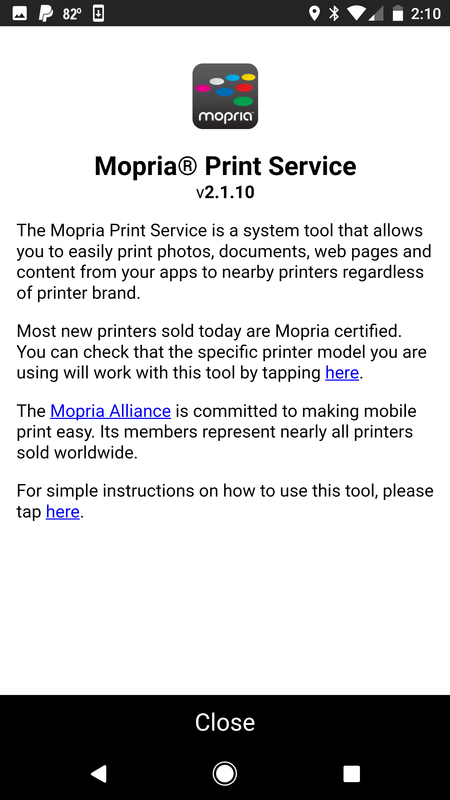 Installing the Mopria plug-in is as simple as heading to the Google Play Store and downloading an app. 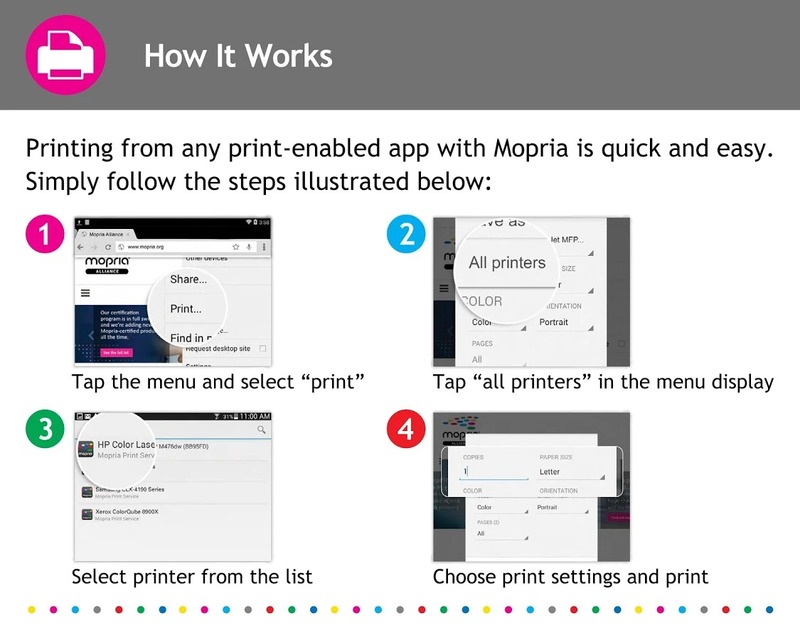 Once installed, you are one step away from printing to a Mopria-supported printer. 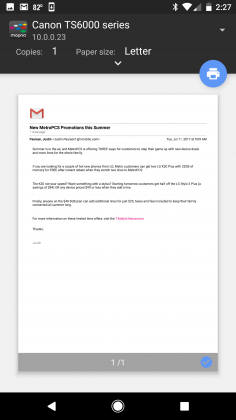 To fully complete the setup, and to try out the first printing job, we went into Gmail and pulled up an email. As you know, Android has an excellent sharing feature that hands off to apps and services. Have a photo? Share it to another person via myriad apps. Or, perhaps export it to Dropbox, Google Drive, or another storage option. In Gmail, though, we now have the option to simply select “Print” from the drop-down menu. It was here where we “added” a new printer, the Canon PIXMA TS 6020. While we had installed it on a laptop computer, we didn’t do anything mobile yet. 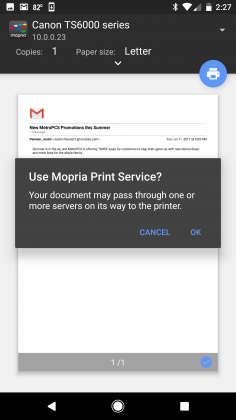 After selecting the Mopria option from our menu, the phone searched our Wi-Fi connection for the printer. 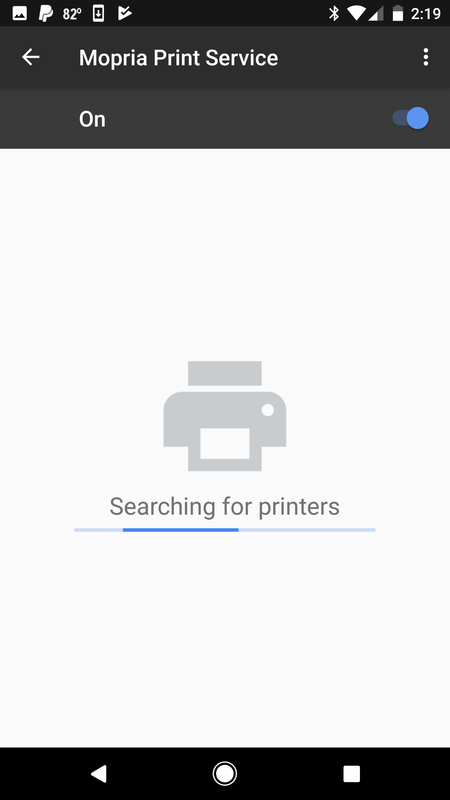 A few seconds later, the phone was ready to talk to the printer. Tapping print on the email prompted us with another pop-up advising that the document could travel through a number of servers on its way to the printer. Tap okay and out comes the printed email. 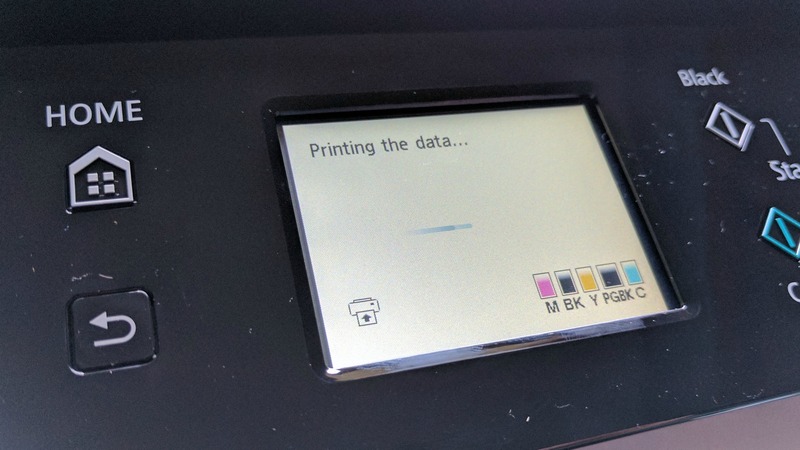 One of the biggest pain points of printers from days gone by is installing drivers. In previous years, we thought nothing of installing files from a CD or downloading from a website. But now that we’re mobile-minded, we expect things to work differently. Mopria essentially does all the dirty work associated with drivers. Installing the plug-in is all the heavy lifting you’ll do; from there, your phone or tablet has all that is necessary to talk to the printer. Each time you print, you have the same options that you’d normally get from a desktop experience. Only need to print a specific page? 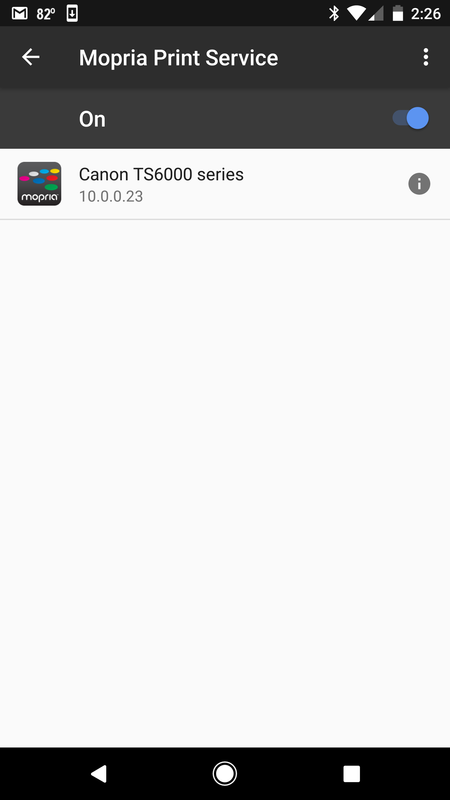 Want to change from portrait to landscape? Paper size, two-sided printing, and color? All of those options are at your disposal. It’s quite awesome, really, how great printing is from a mobile device. 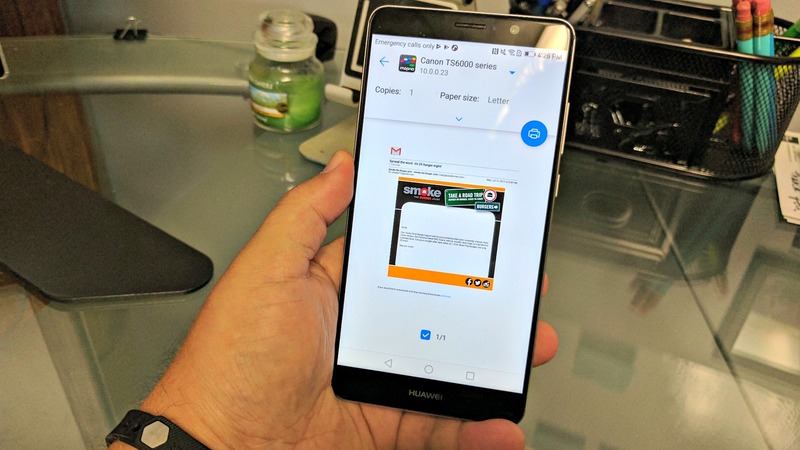 Win a Huawei Mate 9 and Canon printer! 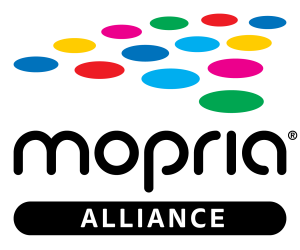 As we indicated earlier, we were sent a phone and a printer from our extremely generous friends at the Mopria Alliance. We loved the experience; the phone is one of the best you’ll find on the market and the camera is stupendous. The Canon printer works terrific as a small office unit and we’ve already taken advantage of the flatbed scanner, too. 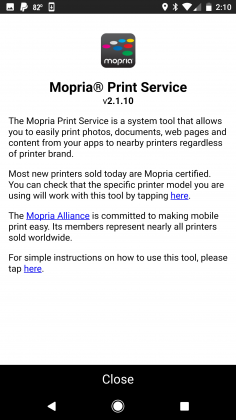 Our partners at Mopria are giving us a second phone and printer combination specifically for us to give out. That’s right, one of you lucky readers is going to end up with the Huawei Mate 9 and Canon PIXMA TS6020 multi-function printer! Sorry international fans, this one is US only. When we choose our winner, you’ll be contacted for your shipping address. You must be 18 to enter and have a US address. In the widget below, you’ll see a few options to enter. The only mandatory option is that you must enter your email address. We will not sell or give away your email address and you will not be signed up for any kind of mailing lists. We only collect your email address so we can contact the winner. Beyond that, you have a couple of options to gain more entries into the contest like following AndroidGuys on Twitter, following Mopria on Twitter, and tweeting out a message letting your friends know that you’re entered into the contest. None of these are mandatory, but you can tweet once a day from the widget for more entries if you wish. This contest will run from right now until 11:59 on August 31, 2017. We’d like to thank Mopria one more time for teaming up with us on this giveaway. 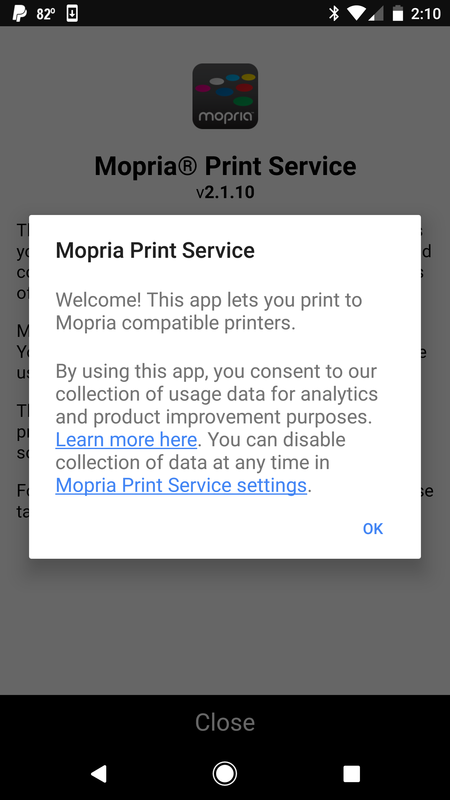 Mopria Print Service is an Android system app that allows you to print to multiple printer brands without having to download an individual app for each printer you encounter. It saves you both time and valuable disk space. Easily print photos, web pages and documents when your mobile device is connected to a Mopria® certified printer through a wireless network or using Wi-Fi Direct®. For more information, you can check out the video below on how to print using Mopria.